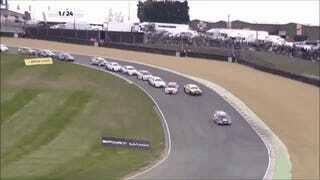 The British Touring Car Championship is beyond rowdy: fact. There's not a lot of mechanical sympathy in the BTCC, that's for sure. Only problem: we don't get it on television. That's about to change. The CBS Sports Network plans to broadcast hour-long highlights of each BTCC race on Wednesdays ten days after each event as part of its Torque.TV block, starting this year. Don't have a TV? The highlights will be up on Torque.TV online as well. Torque.TV is about the closest thing to classic Speedvision in existence, as it was started by a bunch of the original folks behind Speedvision itself. They're featuring not only current series that other networks aren't hosting as well as a lot of racing history docs. So, it's a natural home for something like BTCC.